A man has died and two other people were hurt after a man drove into a pedestrian area in Heidelberg, Germany. The attacker, said to have been armed with a knife, was shot, injured and arrested by police in a brief standoff after fleeing the scene on foot. His motives are unclear, but there are no indications this was a terrorist attack, police say. In December an Islamist attacker drove a lorry into a Berlin Christmas market, killing 12 people and injuring 49. 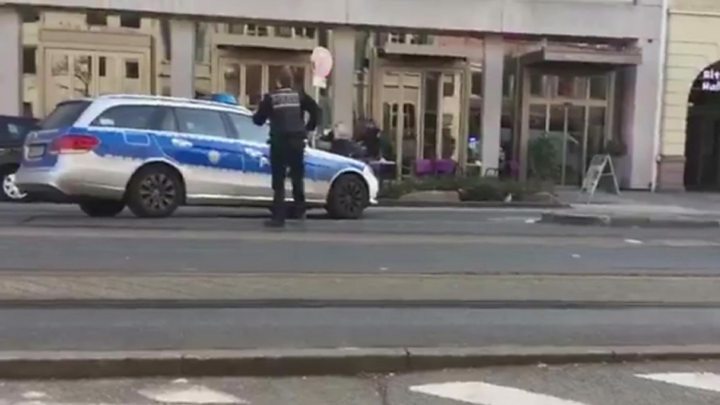 In Heidelberg the attacker, described by police as a 35-year-old German "without a migration background", drove what is thought to be a rental car into pedestrians in one of the city's central squares, injuring three people. One of them, a 73-year-old German man, later died in hospital. The attacker then left the car but was tracked down, shot and seriously injured by police. Police were unable to confirm local media reports that the attacker was mentally disturbed. He is thought to have acted alone. The two injured people were a 32-year-old Austrian national and a 29-year-old Bosnian woman, police said. Their injuries are said to be minor and they have been discharged from hospital.